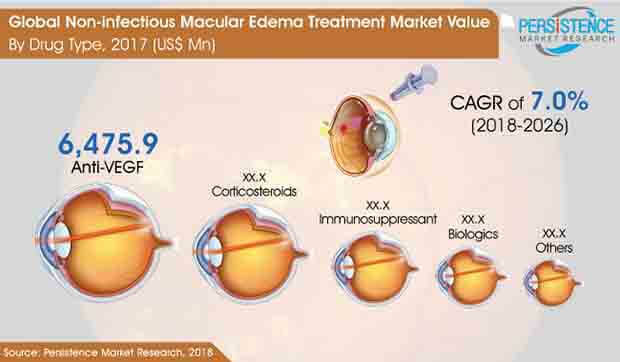 The global non-infectious macular edema treatment market is propelled with the increase in diabetes related complications and awareness in many regions towards eye-related diseases. The demand has an immediate impact on the increase in treatment options available for macular edema. The market comprises drug options like Anti-VEGF, Corticosteroids, Immunosuppressant, Biologics and others. Anti-VEGF is projected to continue holding the highest market share in the global market during the period of forecast. However, the Anti-VEGF market is expected to witness a steady decline in use with the growing awareness about various side-effects associated with this drug. Systemic immunomodulatory treatment will serve to diminish reliance on anti-VEGF. Corticosteroids are also expected to witness an exceptional rise in demand in the coming years. The Corticosteroids market is expected to rise at a stellar growth rate of 8.3% during the forecast period. Intravitreal Implants have been recently approved for the treatment of macular edema. Launch of three new products in 2014 viz., Eylea, Ozurdex and Iluvien, has led to the increased adoption of intravitreal medications in North America. The use of intravitreally injected medications was less common in North America and European countries as laser photocoagulation was the primary treatment before the launch of Lucentis in 2012. This increase in the adoption of Intravitreal therapies is a result of the launch of low dose high efficacy corticosteroid implants for Intravitreal use. Uptake of Intravitreal implants is increasing among patients, thus boosting the global demand for macular edema treatment. Immunosuppressant therapies are widely utilized coupled with corticosteroids. These are generally added to the corticosteroid regimen to eliminate the need for high doses of systemic steroids, or used alone as steroid-sparing agents in situations where steroids cannot be tolerated. For e.g., the three immunomodulators methotrexate (Rheumatrex), azathioprine (Imuran) and mycophenolate mofetil (MMF, Cellcept) are more effective in achieving disease quiescence and are well-tolerated by patients. These work as an efficient treatment type in the cure of non-infectious macular edema thereby proliferating demand in the global market. In several cases, patients and ophthalmologists prefer alternative treatments to anti-VEGF and corticosteroids to treat the various types of macular edema in patients. Anti-VEGF and corticosteroids require repeated injection of costly drugs. Majority of patients do not comply with the treatment schedule and tend to miss injections. If patients are left untreated for more than six months, DME causes irreversible damage to the photoreceptor and permanent loss of vision. This makes the population look for alternative options in the market. Similarly, there are also many counterfeit and off label drugs available in the global market. The launch of biosimilars for some of the blockbuster anti-VEGF agents is also expected to decrease overall market opportunity for the growth of branded and patented drugs throughout the world.